Get the professional-quality video security system you need to protect what you value most without having to pay for expensive installation. A SVAT PRO security system provides the all the equipment you need to cut out the middle man and set up your system, your way. The weather-resistant cameras are built to last with heavy duty mounting hardware and anodized midnight black aluminum casing. Widescreen viewing means you’ll be able to see more of your property in finer detail than traditional DIY systems afford. The included 2TB hard drive, HDMI output and intuitive menu work together to take all the hassle out of installation, setup and storage. And with 1 Step™ Remote Viewing, you’ll be able to play back recorded footage or check on your property in real-time on any device with an Internet connection. Perfect for any business or home application, you’ll experience peace of mind you never thought possible while knowing you did it all yourself with SVAT PRO. 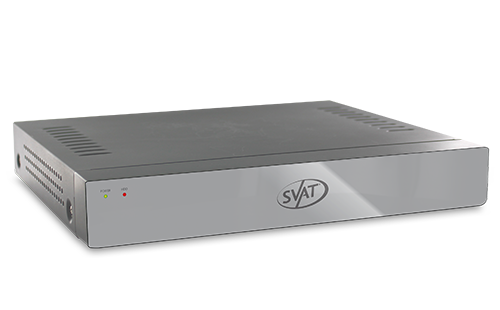 With 34% more surface visibility than standard security cameras, SVAT PRO DVRs use 960H technology to let you see more. Whether you’re monitoring a darkened parking lot or well-lit backyard, your DVR allows you to watch and record video in resolutions as high as 960 x 480. And since you’re capturing video in real-time, you will always have access to a detailed record of all activity happening on your property. Easily check-in on your business or home on the go thanks to our 1 Step™ Remote Viewing software. Simply input your DVR’s IP address (easily found in the menu) into the connection program on your computer, click “Sync to Router”, and 1 Step will auto-network your DVR in seconds. Free to download and free to use on both PC and Mac, take advantage of the convenience of mobile viewing on your smart device without any of the complications. YOUR SYSTEM, YOUR SETUP Customizing your SVAT system is as easy as recording your favorite TV shows to a cable box. Options like Motion-Activated Email Alerts, Area Masking and Event Search are all easily accessible thanks to the menu’s built-in coaching feature, which helps you set up and understand your system’s settings. Whether navigating via remote control or USB mouse, your Pro system speaks your language.